At first glance, the only unusual thing about the meticulously kept graveyard of St. Patrick’s Church of Ireland in Armoy is the fish decorating its weather vane, but as you come around the bend in the road that wraps around the church you’ll see the tiny round tower that stands beside the church’s more-modern (1869) bell tower. The door at the Armoy Round Tower. The first church is believed to have been founded on this site in the late 7th century (naturally, by a disciple of St. Patrick). Building and archaeological work over the years have revealed that the site has indeed been in use for a very long time, with the remains of a medieval church underlying the modern one, and a souterrain found that dates to 1000 AD. Armoy was the principal Christian religious center in the ancient kingdom of Dal Riada, to whose dynastic rulers the founding bishop of the church, Olcan, belonged. There are several things notable about this round tower. It’s currently one of the shortest in the country (10.8 meters/35.4 feet), but this is largely due to the ground around it being built up since it was first built. (If anyone can tell me why this happens, I’d love to know.) When the interior of the round tower was excavated in the 1840s (like most ruined towers, it was doubtless filled with a great deal of debris from old bird’s nests), the base of the tower was found 2 meters (6 feet) below the current ground level outside the tower. At the bottom, buried carefully, was a head that had been carefully severed from its body. This was thought likely to have been the head of a chief or powerful warrior, and was possibly buried in the tower to prevent enemies desecrating it (which would have been common — as on Game of Thrones, displaying the heads of your enemies was a powerful statement). 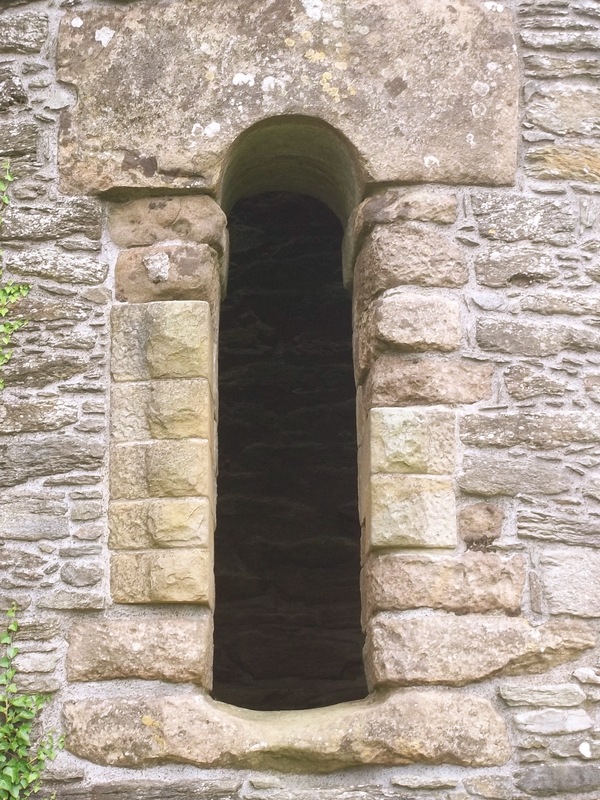 The doorway is notably narrower and taller than most round tower doorways, which might have made it more defensible. However, there is a jutting stone that serves as a stair step to help one climb up to the doorway. I am not aware if this is original or added later, but if the tower was originally intended for defensible purposes, providing a fixed step to gain access would seem a poor choice. As the ground level appears to have been raised since the original tower was constructed, it’s unknown if there are other steps currently buried. 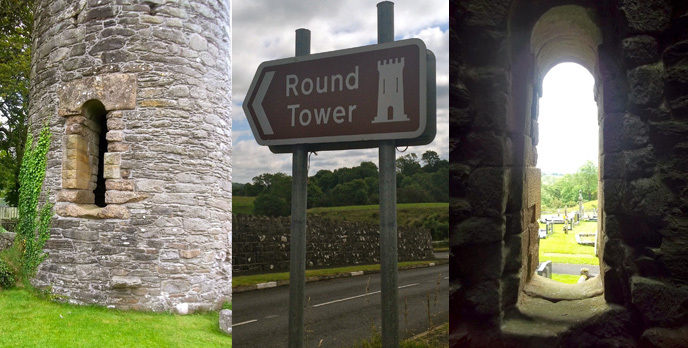 More than many other round towers, perhaps the history and remains of Armoy tower suggests it was a simple bell tower, and not a place of last resort in case of attack? This step allows (relatively easy) access for visitors interested in hauling themselves up into the doorway, and squeezing inside — something I have to think a burly warrior with wearing even rudimentary armor would have had a difficult time doing. Once inside, the tower is clean and the ledges that supported three floors are clearly visible. Armoy churchyard, with the round tower to the right of the bell tower. 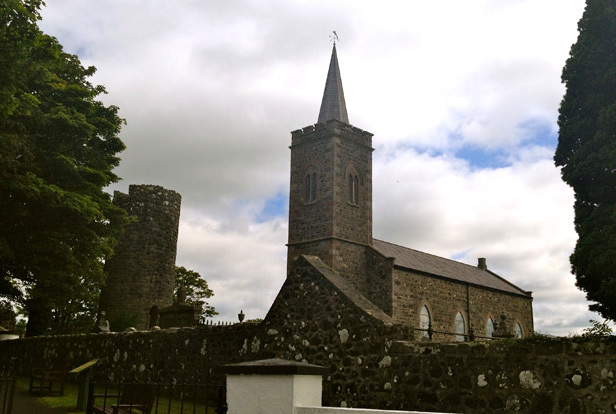 Today, the Armoy church and round tower offer a fascinating glimpse into several eras of Irish history; and thanks to the convenient step and low doorway, it’s one of the few round towers that you can get inside.